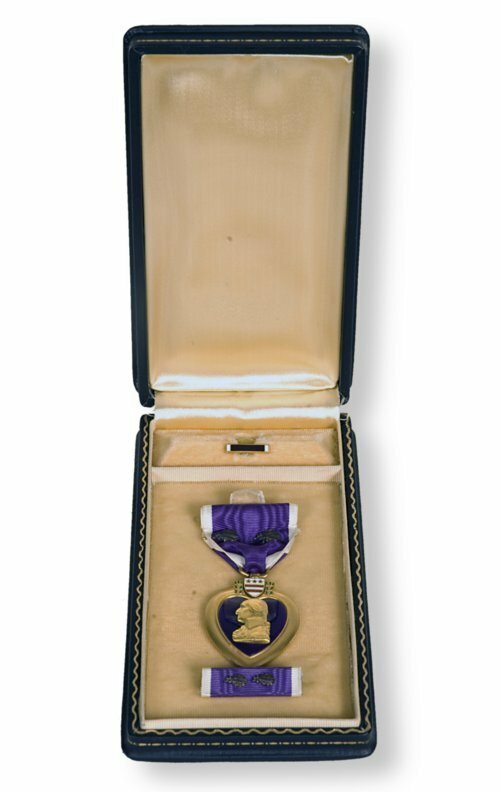 Purple Heart military medal awarded to George Robb for wounds received during WWI. Originally from Assaria, Kansas, Robb trained as a teacher at Park College in Missouri and attended Columbia University in New York. During the war he was assigned as a lieutenant to the 369th Infantry Regiment, an African-American regiment comprised of New York National Guardsmen from Harlem. On September 29, 1918, George was wounded while leading an assault near Sechault, France. His actions that evening displayed such heroism that, along with the Purple Heart, George was awarded the Medal of Honor. Following the war, he worked as a postmaster in Salina and served as the Kansas State Auditor.